Finished Measurements: 66" wingspan x 121/2" deep before blocking, 78" wingspan x 12 1/2" deep after wet blocking. Materials: 3 Hanks of Berroco Modern Cotton (100 grs. each), #1665 Wetherill; 32" length circular knitting needle, size 7 (4.5 mm) OR SIZE TO OBTAIN GUAGE. 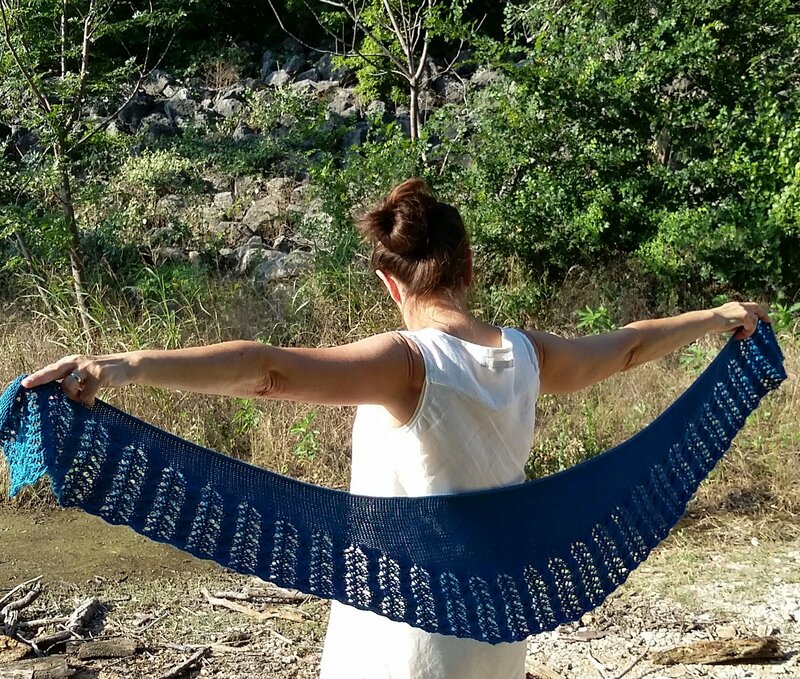 "This shawl is worked from the bottom up beginning with the lace cable twist pattern. The shaping is done with easy to work short rows in stockinette stitch. An I-cord bind off completes the shawl for a beautiful finished edge." Kits, including the pattern and enough yarn in a variety of colors to finish the project, are available on the "Shop Now" feature on our website. Martha Wissing designs with the knitter in mind. Beauty, design, and ease of knitting make each of her pieces a joy to create. The patterns, well written with detailed directions to stitches, read easily. Pay close attention to your gauge for best fit and drape. Enjoy Martha's classic, comfortable designs!